How lovely to see you pop by today! Claudia here - welcoming you to Our Creative Corner as their proud Resident Guest Designer! Step 1: I simply dipped my calligraphy brush into my walnut ink solution and tried different brush and splatter patterns on some tags I had cut from heavy watercolour paper. I let the ink pool in some spots which formed the darker areas. I tried to speed up the drying process with my heat tool but that only started to shift my ink puddles around - so I decided to let everything dry naturally. Step 2: I added some stamped script in dark brown archival ink. Step 3: next I glued on some scraps I tore from old dictionary pages using Matte Medium. My design followed the walnut ink drawn shapes and I tried to create visual tension, adding to the shapes and directions that were already there and trying to enhance any focal spots. Step 4: with a palette knife I added some "Rusty Paper" from Viva Decor here and there. Step 5: I also scraped on a little bit of white Gesso in some spots to fuse all my layers with the white background and to add some texture. The secret to a satisfying result is to not add too much so you still have some "emtpier" areas on your projects that create visual tension (and therefore interest) in contrast to the more busy ones. Step 6: I finished off my tags by adding some word stickers and handwritten words. I love the circle shapes where the ink has puddled in some areas. These were "stamped" on by dipping a felt tip pen cap into the walnut ink. The large circle was hand drawn. If you use Walnut Ink Crystals on mixed media pieces always keep in mind that they react to moisture (from paints other inks, water, glue,...) and will bleed through. You can spot this a bit with the image above where the white Gesso got a slight brownish tint. You can either make this effect an intentional one with your projects or make sure you seal those layers before you continue adding other media that might re-activate your walnut ink marks. But no matter which way you choose - using Walnut Ink or any other die inks always is great fun! Where do you live? I live in Albion, Indiana, USA - a very small rural town in the mid-west. What makes you smile? So many thing...experimenting with a new art medium; tearing the wrapping off of a new ink pad or inking up a stamp for the first time; finding a stash of vintage ephemera waiting to be loved, jumping in and getting messy... I like the hands on approach to art and enjoy getting inky! What is your favourite style of crafting? I'm a bit of an eclectic artist - it depends on what mood I'm in and what has inspired me on a particular day. I can go from CAS all the way to the other spectrum and get down and dirty with paint, inks and ephemera! Name one product you couldn't live without and tell us why. Memento Tuxedo Black Ink - It's such a lovely ink to work with, it produces nice dark impressions and can be used with a variety of other mediums. Paint or ink? Or both? Why? Both! There are just too many fun techniques where you can layer on more of both. My name is Ink Stained Roni and I was so excited when my sewing themed collage was chosen as the winner, Little did I realize I would also be asked to be April's Top Talent ~ very thrilling. I enjoy the challenges so very much here at Our Creative Corner that I decided to follow along with this months challenge - Gypsy Fayre. and created my project with that in mind. So I gathered up all of my spare beads and decided to make a chunky gypsy bracelet or at least what I would imagine they might wear. I tried to incorporate as many of the beautiful bright colors from the inspiration photo and swatches as I could. It was one of those projects that once I started I couldn't stop until it was finished. Needless to say, my sweet husband had to wait on supper a bit that night. He's a good sport though - he understands when inspiration hits you just have to go with it. Thank you so much for allowing me to share more of my art with you and your readers. Wow!! I adore beads and just love what Roni has done with hers. (I don't make jewellery and always have the greatest respect for those who can!) Even better that she cleverly based it on our current challenge Gypsy Fayre! I had to laugh when Roni said that both supper and a hungry husband couldn't stop the creative process! Roni, it has been a pleasure communicating with you and getting to know a little more about you from your Questions & Answers section. Thank you so much for taking the time to join us with your gorgeous bracelet. I hope everyone will pop over and visit you to see more of your creativity - just click here. If you haven't joined in with Candice's wonderfully quirky challenge yet, just click here for the full details and link up with us. The winner of Candice's Gypsy Fayre challenge will be our final Top Talent spot. If you want to be that person, you need to get busy NOW!! Thanks for joining us today and remember to visit the lovely Roni and leave some love! Welcome to the second of our Sponsor Spotlight posts at OCC in April. And we have our amazing Trish here today to share with you a brilliant creation using a Tando set - and her creation is as wonderful, bright and dazzling as always! You have in for a treat today! Hello! I am thrilled to be sharing a project today, using an amazing kit from TANDO CREATIVE! The kit I used is the MDF shelf kit, with a heart cut out. This one! 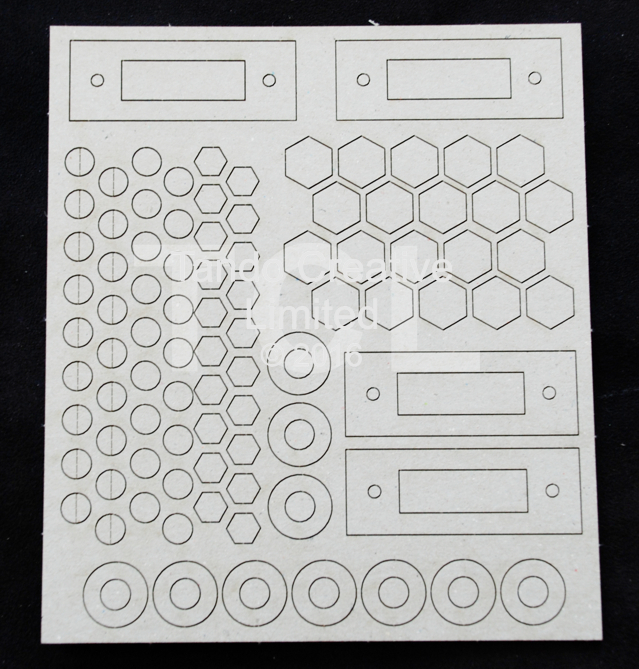 These kits are made from sturdy 3mm MDF, so they will hold all sorts of stash! I glued it together first.. Even though some detail won't be seen, it's good to get lots in at this point! I even doodled around the cut out heart! A coat of clear varnish and the design won't chip off or get discoloured when you start to use it as storage. Don't forget, our Gypsy Fayre challenge still has a few days left to run! You could be the randomly picked winner who receives a set of Tando goodies! 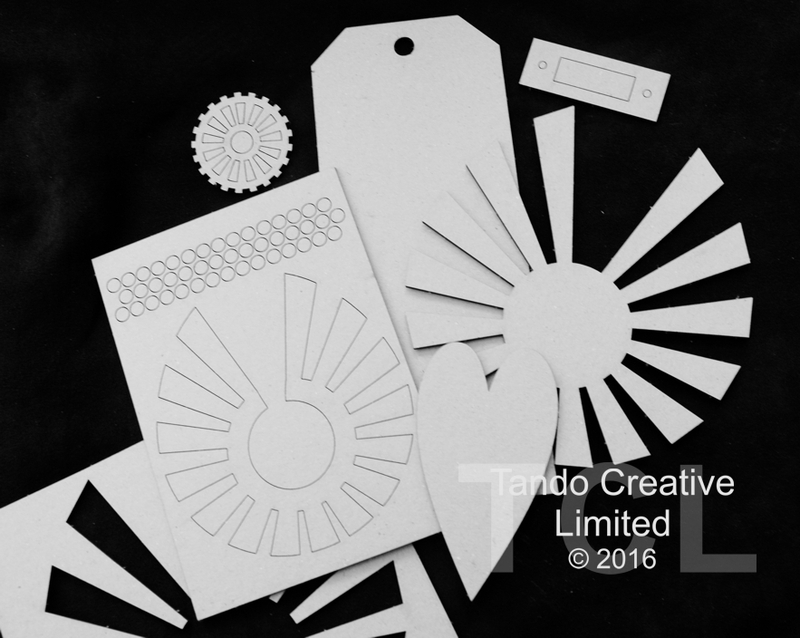 Laura here with the first of our two Sponsor Spotlights this month from Tando Creative! Tando is such a fantastic company with so many items to choose from. This month I chose to work with their latest release designed by Andy Skinner - Industrial wings kit. 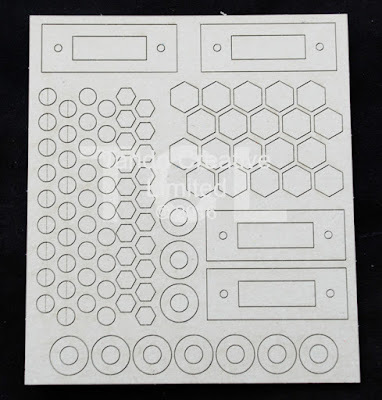 Included in this amazing kit is a long tag, two sets of industrial wings, a set of circles, a heart, small cog and bookplate - amazing value for just £3.99!!! I also chose the Andy Skinner Industrial Bolts/Washers kit - because it is obviously a perfect addition to this lovely set. I knew I wanted to work with muted colours and chose to focus on my favourite colour combination of turquoise and brown. All paints used are Decoart Media Fluid Acrylic paint. I started with the long tag. I painted it with Burnt Umber. This was then given a coat of Decoart Weathered wood and followed with a coat of white paint. This of course crackled beautifully. I then used a stencil by Andy Skinner to stencil numbers at the top and bottom of the tag using Burnt Umber mixed with water and dabbed on with a sponge to give a muted look. The edges of the tag were dabbed with Burnt umber using a finger smeared along the edges....great fun! I then splattered some very diluted white acrylic paint all over the tag with a paintbrush. The wings were painted white and then dry brushed with the Cobalt Turquoise Hue paint mixed with white paint. I then applied Decoart Media Crackle Glaze and left it to dry. When dry I covered it with a mix of Carbon Black and English Red Oxide Antiquing cream. The heart was painted with White acrylic paint and then had strips of french dictionary paper added. The book plate was given the crackle treatment too after applying a coat of Cobalt Turquoise Hue mixed with white. The industrial set includes washers and bolts of all sizes and shapes. I decided to cut the cog in half and place one piece either side of the heart and I glued the other bolts and washers around them. And there is the finished tag! Hope you like my sponsor spotlight for today! Check out all the items Tando Creative sell on their website. And enter this months Gypsy Fayre challenge and you could be the lucky winner of a bundle of Tando goodies to play with!